Microsoft's productivity suite is now available in a 4-year subscription model for students, faculty and staff of accredited educational institutions in India. Microsoft has announced its Office 365 University package in India, meant for full-time and part-time students, faculty and staff from accredited universities and educational institutions in the country. For Rs. 4,199 and a 4-year subscription, students get a two-PCs or Macs licence for Word, PowerPoint, Excel, OneNote, Outlook, Publisher and Access, apart from Office on Demand, which allows for access to the online Office 365 suite, and 20GB of SkyDrive storage. Users will also get access to tablet and mobile versions of the Office apps. Speaking of the Office 365 University launch, Ramkumar Pichai, GM, Microsoft Office Division, Microsoft India, said: "University students will love the capabilities of new Office. 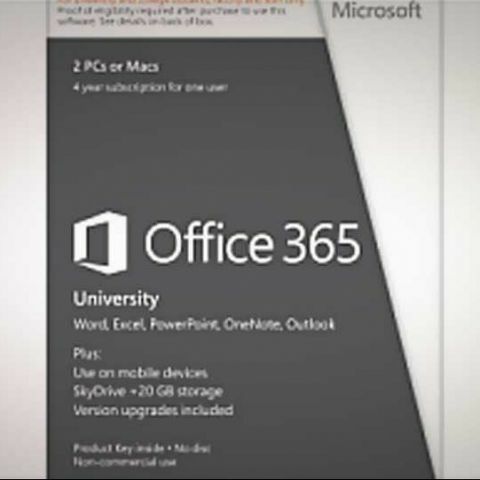 Office 365 University will be a trusted and integral part of students' everyday always-on, always-connected life, taking full advantage of the cloud and touch capabilities, all at the best price." 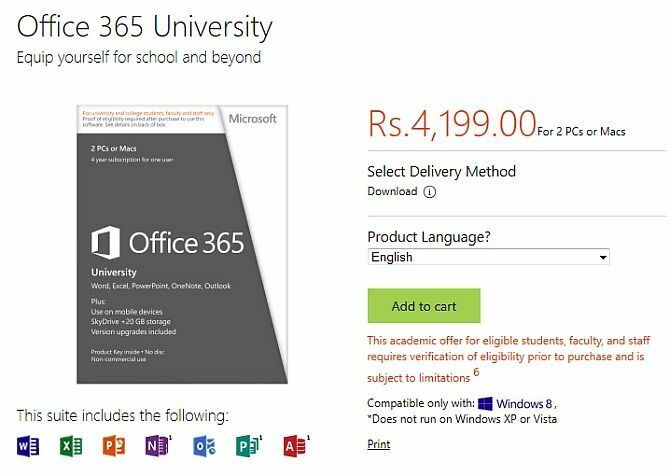 Students have to visit www.office.com/verify to verify their institution’s eligibility before the can purchase Office 365 University. More details can also be found on the Microsoft Store page. Students will also be able to provide the necessary details via a manual verification process. Windows 7 or 8 OS and an Internet connection will be required to complete installation. Application availability and features will vary by platform and device. Publisher, Access and OneNote available on PC only. Current Office application versions for Office 365 are Office 2013 for Windows and Office 2011 for Mac. Customers with an active subscription will be entitled to the newest versions when available. The move by Microsoft marks the first major step towards offering student-aimed educational packages in India, something the Redmond-based company has been offering to other countries for years. It is also interesting to see cloud-based models becoming the norm, with Adobe’s Creative Cloud suite also readily available.